Eyelid surgery also referred to as blepharoplasty, is a financial and time investment with a return on investment – a youthful and refreshed appearance – enjoyed for years by adults of any age. According to statistics from the American Society of Plastic Surgeons (ASPS), the national average cost of eyelid surgery is $3,022. 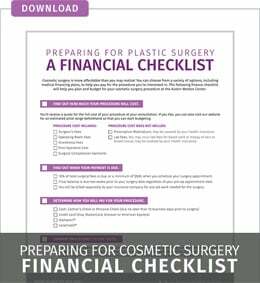 However, it’s important to note that this price typically does not factor in other surgery-related expenses and factors that make up the final bill. It also does not include variables such as surgeon selection or geographic location, and these can vary dramatically. The primary variables that affect total cost are adjunct procedures, the surgeon's experience, surgical facility fees and surgery-related expenses. After factoring in these variables, the overall cost of eyelid surgery can range from $4,000 to $6,000. The cost of eyelid surgery will vary widely per patient, so it’s essential to make sure you are comparing apples to apples. More importantly, make sure you are looking at the costs in the right light. Remember, this is your face; you want the best care possible, not the least expensive. Eyelid surgery includes procedures on your upper eyelids, lower eyelids, or both. Based on a preoperative evaluation of factors such as your underlying facial muscle structure, bone structure, and the symmetry of your eyebrows, your surgeon will decide how much skin, muscle, and fat to remove. A board-certified plastic surgeon will choose the right procedure for you based on your physical characteristics and aesthetic concerns. Your surgeon will place the incision line at the natural eyelid crease through which he or she will remove excess skin, muscle, and fat. Lasers may be used to remove this excess tissue to reduce swelling and bruising. There are a variety of options for performing lower eyelid surgery. The traditional approach places the incision just below the eyelashes, trimming and repositioning excess skin and fat, and tightening the lower eyelid muscle. In the transconjunctival approach, effective in improving lower eyelid bags and puffiness, your surgeon places the incision inside the eyelid. Your surgeon can remove excess fat through a transconjunctival incision, but not excess skin. The ‘skin pinch’ blepharoplasty removes only a bit of skin which is effective if you have strong lower eyelid support and only a little extra skin. For some patients, laser resurfacing can both tighten excess skin and remove wrinkles. It’s safe to say that cost can significantly influence why a patient chooses to have a procedure done by one surgeon over another. All surgeons have their approach to performing eyelid surgery as each doctor has different amenities at their disposal and varying levels of experience and accreditations. At Austin-Weston, our four board-certified plastic surgeons have accumulated a combined 75 years of experience, and with that have cultivated an excellent reputation in the DC Metropolitan Area. Each surgery is preceded by an extensive consultation involving computer analysis and imaging technology, as well as the master-eye of our surgeons to ensure that we deliver satisfying and life-changing results for our patients. More lightly populated regions like North and South Dakota, Idaho, Mississippi and Arkansas charge much less. Mid-level costs are incurred in Phoenix, Tennessee, Ohio, Indiana, New Mexico and Illinois along with locations away from the major cities within high-priced states. To find ballpark prices for procedures based on location try using the Healthcare Blue Book (it works the same way Kelley Blue Book lists the prices of cars). The cost of anesthesia for eyelid procedures can vary significantly for each patient. You want to make sure anesthesia is administered by a board-certified anesthesiologist or a CRNA (nurse anesthetist). If a surgeon uses a non-certified anesthetist nurse or a medical assistant to push the anesthetic drugs (and yes, unfortunately, this does happen), then your safety may be at risk. Anesthesia costs are typically billed hourly, and you should ask in advance what happens if the surgery goes longer than expected, and who will pay the extra anesthesia time. After calculating the cost of surgeon's fees, anesthesia, surgical facility fees and all other expenses, the overall cost of eyelid surgery can range from $4,000 to $6,000, if not more. Many people don’t have this amount of money at their immediate disposal, but when the decision is made that it’s the right time to undergo the procedure, it becomes necessary to consider financing options. Practices almost always accept credit cards, but patients should carefully consider the associated interest rates of all available options. Also, several third-party financing companies deal exclusively with those who want or need treatments that are not covered by insurance. While cost is obviously an important consideration when it comes to eyelid surgery, it is not the most important one. Patients should remember that their health and cosmetic satisfaction are ultimately the top priorities. Choosing an inexperienced surgeon to save some money could cost far more in the long run if they require a corrective procedure or if they develop serious health complications. The four board-certified surgeons at Austin-Weston are committed to providing patients with the results they desire and the care and safety they deserve. To learn more about your plastic surgery options, please call (703) 854-9841 to schedule a consultation.